I’m getting more into using Color Labels for my work. Since I think labeling should be possible from anywhere I searched for a way to add Labels from the command line and Alfred as well. Alfred is quite an easy task. A couple new extensions, plus some icons that can be called from the Actions do the job quite well. 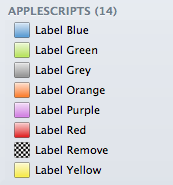 I made one extension for every color and one to remove the label. The extensions can “toggle” (label/unlabel) the color as well. The command line option is a bit trickier, because OS X doesn’t have a CLI utility to set color labels directly. A neat script added to your .profile should do the trick though. I made some changes, since I don’t like typing label 4 file.txt to label an item. label yellow file.txt seems more naturaly, isn’t it? Note that you can remove a color label by typing “remove”, “none” or “blank”, e.g. label none file.txt or label remove file.txt. echo "USAGE: label [0-7] file1 [file2] ..."
echo "Sets the Finder label (color) for files"
echo " 0  No color"